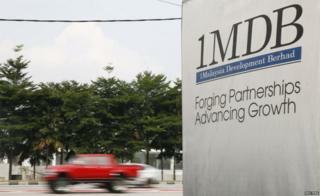 The US Department of Justice has moved to seize more than $1bn (£761m) from Malaysia's state fund 1MDB. The department alleges the funds were "misappropriated" and though it did not name Prime Minister Najib Razak directly, he is identifiable in the suit as someone whose account allegedly received huge sums. He has in the past denied wrongdoing. Mr Najib set up 1MDB in 2009 to turn Kuala Lumpur into a financial hub, but it missed debt payments in 2015. The US justice department alleges the "misappropriated" funds financed lavish lifestyles of "multiple individuals including public officials". There is no allegation that Mr Najib spent any of the money but people close to him are accused of using billions of dollars to buy jewellery, art and luxury properties; pay gambling expenses; and hire musicians and celebrities to attend parties. The court papers, filed in Los Angeles, allege that money was laundered through accounts in the US. If successful the US justice department would seize assets, including property in the US, UK and Switzerland. The $1bn would only make up a proportion of the money that was allegedly diverted, which comes to more than $3.5bn (£2.6bn). Mr Najib's stepson, Riza Aziz- who produced the Leonardo DiCaprio film The Wolf of Wall Street - is named in the court papers, as are a Malaysian financier and two Abu Dhabi government officials. A spokesperson for the prime minister said the government would "fully co-operate with any lawful investigation of Malaysian companies or citizens in accordance with international protocols". "As the prime minister has always maintained, if any wrongdoing is proven, the law will be enforced without exception." The fund started to attract attention in early 2015 when it missed payments for the $11bn it owed to banks and bondholders. The Wall Street Journal (WSJ) reported it had seen a paper trail that allegedly traced close to $700m from the troubled fund to Mr Najib's personal bank accounts. 1MDB said in a statement last year that it had never given money to the prime minister and called the claims "unsubstantiated". It has repeatedly stated that the company has assets worth more than its debts. Mr Najib has denied taking money from 1MDB or any public funds. Earlier this year he was officially cleared of wrongdoing by the country's attorney general.